The photograph above is of Loyd Farm’s farmhouse. The photo was taken by my friend Robin Ashby, the editing is all mine. I wanted something to accurately reflect how I was feeling after hearing the little bits of snippets I have heard regarding the commissioners’ meeting in Caln last night. Bleak and disgusted is how I am feeling. Apparently the Valentine’s Day gift to residents was sharing the tidbit of joy that the developer of this parcel has submitted a demolition permit and it has been approved? Does anyone have a copy of the demolition permit and demolition permit application? They are things that can be obtained via a right to know form. And Caln can try to stall you on that but it is the right for the public to see that. Caln does have a right to know form and you can find it by CLICKING HERE. It’s time to start peeling back the rotten layers of this moldy political onion isn’t it? Who really runs Caln Township? The commissioners seem like a bunch of sheeple don’t they? And yes I know some are going to take umbrage with that descriptive adjective of their beloved commissioners, but people who are really interested in land preservation, historic preservation, open space preservation, and more actually try to do more for their residents don’t they? I have always been a realist. I know you can’t save every old house. But what I don’t understand is why no one is willing to try to save this old house? I believe the people who have told me that the building envelope is intact enough for restoration. After all, we have seen what has happened in other parts of Chester county when it comes to old houses and restoration haven’t we? Three examples of this for me are the following: Loch Aerie Mansion, Linden Hall (even if I don’t like what’s going on there now, that is a true comparable to the Lloyd Farm’s farmhouse as far as condition and even age and I think the condition of Linden Hall was probably worse when they started restoring it), and The Covered Wagon Inn in Strafford. Loch Aerie and Linden Hall are in East Whiteland and The Covered Wagon Inn is in Tredyffrin. And even Toll Brothers has saved historic farm houses and structures on several properties they have developed. That doesn’t mean I am suddenly condoning their cram plan density of their developments in Chester County, but even they have managed to save a few historic structures haven’t they? On Church Road in Malvern is there not an old farmhouse that was definitely open to the elements that they are in the process of restoring for that new development right there? There is another one in Chester Springs isn’t there? And that one in Chester Springs was in horrible shape – it was on a dirt road when I sought I think since then the dirt road has been paved to a regular road. And don’t forget DuPortail House in Chesterbrook. Chesterbrook was a horribly contentious development back in it’s day and even there the historic farmhouse was preserved. Now every year multitudes of brides get married and have their receptions there. Other events occur there. People love it. In Caln, what else does this developer own? Is Loyd Farm just part of a larger plan yet to unfold? Is it true that this developer is also the owner of County Propane in Downingtown? I don’t have those answers but I have to tell you at this morning I am tremendously upset because I feel like a narrative is being crafted and molded to suit the ends of a future development if that makes sense? There seems to be almost this mynah bird repetitiveness that is emerging about how the farmhouse is not salvageable and is not restorable and how do we know this is actually true? When did what communities wanted for themselves stop mattering? This whole thing about demolishing the Lloyd Farmhouse reminds me of when La Ronda was demolished in Bryn Mawr. When La Ronda was demolished around 2009 it was because in the end because the property owner could, not because he had to, remember? And that gentle readers, is the catch 22 of living in a private property rights state like the Commonwealth of Pennsylvania. It’s not necessarily right, but it is their right. However what happened to elected and appointed officials who actually cared about where they called home? When did we the people literally stop mattering? Whether it’s pipeline companies, developers, billboard companies and more why is it that it seems like everything they want matters more than what the people who live in the communities want? Our history matters in Chester County. Our equine and agricultural history matters and farms are just disappearing day by day to developments. This developments come in and everything gets jacked including the taxes and how are farmers supposed to be able to afford to farm? The short answer is they often can’t and they just want to get out. At this current pace we are going to turn into a county that has to import all of its food. 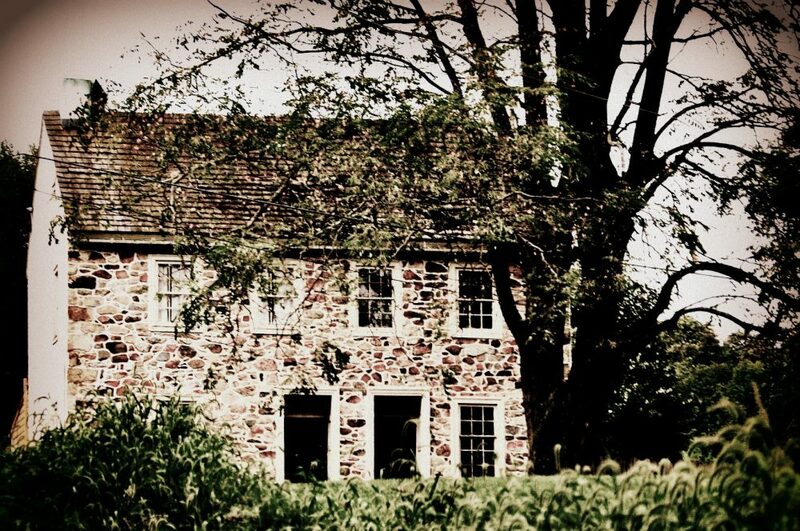 The Chester county farmhouse is a classic and well-known architecture style. You know, like actual carriage houses? And in development after development they tell you they are mimicking farmhouse style and carriage house style so why not save some of the actual farm houses and carriage houses for Christ’s sake? I was told by a resident and have not yet researched it on my own the following: Mary Louise Lloyd sold the property to nuns to build a hospital on in the 1970s – supposedly 1976. Then Mrs. Lloyd built her own house on Lloyd Avenue. Apparently then she opened something called Copeland Run Academy and lived and worked there. She donated the land that is Lloyd Park to Caln when she sold the farm. That of course is the recent history and again, the history of Lloyd Farm also known throughout history as Valley Brook Farm goes back to a Penn Land Grant. We can’t just keep bulldozing our history. That’s as plain as I can state it.